Will bright lights increase gambling, pick a motto for the U.S., Fargo as the bean-bag capital, the war at home, and Fergus Fallsywood. 1) WHY DON’T YOUNG PEOPLE GAMBLE MORE? Young people, what’s stopping you from buying pull tabs? With Gov. Dayton acknowledging that there’s no political stomach for a sales tax increase to pay for a new Minnesota Vikings stadium, attention is turning to electronic pull tabs, MPR’s Tim Nelson reports. “Bingo and pulltabs would likely be played on different devices, but the move to electronic displays is expected to bring more people, especially younger patrons, flocking to charitable gambling in bars,” the paper said. But casinos have bright lights, keypads, and animated screens too and the majority of patrons at most of them can tell you all about the Eisenhower administration firsthand. The assertion seems to come from a Pioneer Press article in which King Wilson, the head of the Allied Charities of Minnesota, claimed electronic pulltabs would appeal to young people. In the same article, he revealed that the amount of money generated from pulltabs has plummeted in recent years. But in the same article, Rep. Sen. Tom Bakk said electronic pull tabs could bring in another $40 million, half of which would go to the Vikings’ stadium. That’s a lot of money coming from — apparently — mostly young people. But what if it doesn’t? Does the money get diverted from charities who benefit from pulltabs now? House researcher Pat McCormack said an analysis of the change could generate up to $42 million a year. He said estimates depend on the tax break given to the charities. If true, part of this “new” money coming in to the charities and Vikings is “old” money that’s now going into the state’s General Fund. That money is currently spoken for, which means Minnesota would stop doing something in order to build a stadium for the Vikings, and there we are back at an old — still unanswered — question: What is it we’re going to stop doing so that the Vikings can have their stadium? It said the smoking ban may have had something to do with those numbers, but pulltab revenue was tanking even before the state smoking ban went in effect. It also notes that the industry has been trying to get electronic pulltabs approved for years, back to when an iPad-like device would attract significant attention. Now? Who drops what they’re doing to see the person with the iPad? Maybe proponents are right. Maybe the lure of bright iPad-like devices are enough to not only turn around a dying industry , continue funding charitable groups at present levels, and build a new stadium for the Vikings, and get young people to part with their loot, but it’s not too early to see the math. The U.S. House of Representatives is taking a strong stand against efforts to the strip the country of its “In God We Trust” motto, even though there are no particularly effective efforts underway. The House fast-tracked a bill reaffirming the motto. “As our nation faces challenging times, it is appropriate for Members of Congress and our nation — like our predecessors — to firmly declare our trust in God, believing that it will sustain us for generations to come,” Rep. Randy Forbes of Virginia said. The measure puts opponents of the measure in the unenviable position of voting against God. Or country. Or one of the two, if not both. The U.S. had a motto — e pluribus unum — for many years until Dwight Eisenhower changed it. But it was (a) Latin and (b) doesn’t really describe the country. “From many, one.” If that’s not Socialism, what is? Rabbi Brad Hirschfield, writing on the FoxNews website, asks a good question: Why don’t we trust each other? So while Republicans will introduce the legislation supporting the use of “In God We Trust”, and Democrats will rail against it, neither will do anything to address the real question we have in this country – do we trust each other to come together and fix what’s broken? Do we trust in our capacity as a nation to give out children a better country than the one which we inherited? Those are the real trust issues we need to address in this nation, and it’s high time to we start doing so. Coincidentally, or perhaps not, several smaller cities in the country last week hurriedly pushed through ordinances to allow “In God We Trust” to be displayed in their City Council chambers. Question: If we were to come up with a wholly accurate motto for the country, what would it be? Reminder: “You can pay me now or you can pay me later” is already taken. A Fargo man has set the unofficial record for a beanbag toss. From 109 feet away, Jason Vadnie hit nothing but whatever you hit nothing but in beanbag tossing, the Fargo Forum reports. It was a moment to remember. His arms went up, the bag went in, and the world record for the longest successful beanbag toss went down – unofficially, at least. The feat took two days and produced plenty of soreness. In the first outing, “we threw for probably two or three hours and didn’t make a shot,” Vadnie said. But in the end, the Fargo 25-year-old says he beat the record, set last October, by 3 feet. His throw would shatter the mark for an underhand toss by 24 feet. NPR this week is providing a multi-part series on the 3rd Battalion, 5th Regiment deployed to Helmand province in southern Afghanistan. By the time the tour ended in April 2011, the Marines suffered the highest casualty rate of any Marine unit during the past 10 years of war. 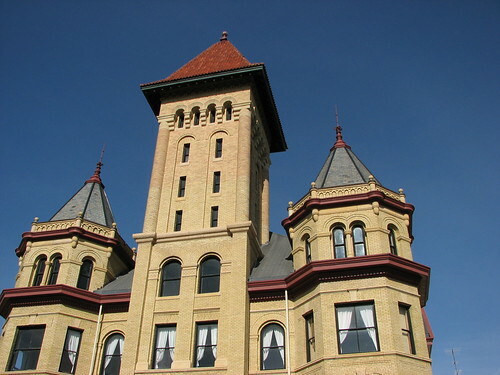 Is this building Fergus Falls’ ticket to fame? It’s the former Fergus Falls Regional Treatment Center, which included 37 buildings on about 180 acres (See a 2004 MPR profile). The city has been trying to market the site, but various development proposals, including houses, have fallen through. Now, there’s another idea: a movie set. The Fergus Falls Daily Journal says the Minnesota Film and TV Board will be in town this week to shoot a promotional video to market the site to Hollywood et al. A board official says it would be perfect for horror movies, psychological thrillers or just movies set in a mental institution or hospital, like 1992’s Ray Liotta, Kiefer Sutherland and Forest Whitaker vehicle “Article 99,” the newspaper says. Chris Grap, director of production services with the board, said once somebody makes a movie with the site, others will surely follow. But it’s a race as city officials have debated just tearing it down. Herman Cain’s presidential campaign has been dogged this week by allegations that he sexually harassed two women while head of the National Restaurant Association in the 1990s. The controversy comes 20 years after Senate hearings into sexual harassment charges against Clarence Thomas, then a nominee to the U.S. Supreme Court. Today’s Question: How has your understanding of sexual harassment changed over the years? With a proposed local sales tax increase for a new Vikings stadium off the table, The Big Story Blog will look at the remaining financing options, what’s politically viable and how the push for a stadium is likely to play out now. Midmorning (9-11 a.m.) – First hour: How attitudes towards sexual harassment in the political arena have changed. Second hour: On the 130th anniversary of his death, a best-selling author tells the story of President James Garfield. Midday (11 a.m. – 1 p.m.) – First hour: The latest on the Vikings’ stadium negotiations. Second hour: National Review editor Ramesh Ponnuru on the future of conservatism. Second hour: Is Western civilization losing its advantage? #1) Both of my “kids” are young adults now and neither of them have the money within their respective budgets to waste on any form of gambling–blinking lights or not. If they visit a casino at all, it’s for the buffet. I had no idea what a pull tab, electronic or otherwise, was! I just don’t get pull tabs, electronic or otherwise. Aside from the fact that you’re pretty much flushing cash down the toilet, it’s just plain boring! Maybe I just don’t drink enough to find it entertaining. I’m a young person and not a big fan of pull-tabs (or gambling for that matter). But electronic pull-tabs sound even less appealing to me than the paper ones. I’m not a fan of the Vikings either though – so maybe it works out. I have only played pull-tabs once. Powerball, however, I have ‘played’ a lot more. Including buying tickets for tonight since it is up to almost $250 million! #1) I’ve never been a big fan of gambling in general. I won’t snub my nose at scratch off games if I get them as a gift, but the need to try my luck and see if I win just isn’t there for me. #2) Assuming a motto is meant to embody an idea you are trying to achieve (not necessarily where you’re at) I really do think “e pluribus unum” is a great motto for our country. We have such a diverse history and background with people all over the world coming here to form one country. Perhaps all our efforts to improve math scores has resulted in young people who understand that the house always wins in the end. This is the first story I’ve seen that pushes back on the claims of stadium supporters and gambling proponents. It is a Too Good To be True claim that a casino or other additional gambling will solve all of our problems, a new football stadium giveaway, the Target Center, the state budget shortfalls. I’m practically waiting for the world hunger solution pitch as well. By not raising taxes or insisting that the owners pay for their own guaranteed return (football owners only make money, lots of it) this is pushing the financing onto those farther down the ladder. The 1%, even the 10%, avoid the impact. An Accurate motto for America of today? instead of living our own lives in an active, participatory manner? Nah, I knew I must have been wrong. Just a suspicion, with no research to back it up, but electronic pull tabs may very well be a ruse to lead to networked pull tabs which is what they very well may want. #5) This is the same song different verse. There have been multiple attempts to have the RTC be the setting for a movie of some sort. The only movie I’ve ever seen actually use that place is one from my video productions class in high school. I’ve played pull tabs in the past, they are sort of fun, but none of the bars I go to have pull tabs. I can’t think of a single bar in uptown/dinkytown/downtown that have pull tabs. Maybe the uptown VFW? So maybe it isn’t that people under 40 aren’t interested in pull tabs, but that they aren’t available in places young people go? Because a bar with pull taps immediately becomes a not very cool bar. I spent an entire summer selling pull tabs. I can tell you EXACTLY who bought them, and it wasn’t anyone I’d be really excited to try to find a way to extract more money out of by changing the game to being electronic. It was, hands down, the most depressing job I ever had. The two links note that the requirement for including it on money dates from 1908 and the adoption of the phrase as THE national motto was by law during the Eisenhower administration. Maybe the Vikings could do a horror movie (insert current season joke here) in the Fergus Falls hospital and use the profits to pay for a stadium? #1) young people must be good at math?